AeroShell Grease 33MS is an extreme pressure (EP) grease based on the proven lithium complex technology of AeroShell Grease 33, and is fortified with 5% Molybdenum Disulphide. The benefits of Grease 33MS include: Improved anti-wear and corrosion resistance over AeroShell Grease 17; It is fully compatible with AeroShell Grease 33, so reduces the risks and problems associated with misapplication; Load carrying and EP properties equal to that of the well established AeroShell Grease 17; Fully approved to MIL-G-21164D. It possesses enhanced anti-wear and anti-corrosion properties and is particularly suitable for lubricating heavily loaded sliding steel surfaces, such as, for example, bogie pivot pins on aircraft landing gear-assemblies. 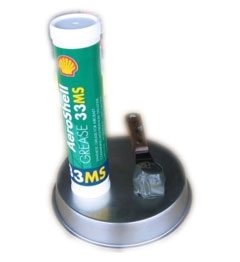 AeroShell Grease 33MS is a direct alternative to AeroShell Grease 17, but when changing from (clay-based) ASG 17 to (Li-complex based) ASG 33MS, the normal rules on grease changing should be applied. Got me what I needed and were friendly and helpful in accomplishing that...Lynne is really nice. Ordered a single tube of grease and was treated as if I had made a huge purchase. Friendly and responsive, Lynne was on top of the whole transaction, and helped me to correct an error I had made on the payment. Good folks, I'll be coming back.